When I need potholders, whether they are for myself or as gifts for others, it really doesn't take very long to make one, or two, or even an entire set! I like to use up scraps and make any and all kinds..from art potholders, mitts and other "kitchen quilts" that can be displayed as little works of art year round to practical ones ..the easier, the better! 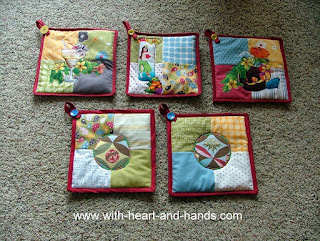 My double sided, double ended quilt mitts at the end potholders, are especially popular and often requested as gifts. The double ended potholder or casserole grabber is great for hanging over the over door handle and grabbing out casserole pans, pies and cakes or anything requiring two hands and easy dexterity! This one comes out in the fall..starting in late September through Thanksgiving! And it has lots and lots of coordinating regular potholders and table mats, table cloths for buffets and so on. 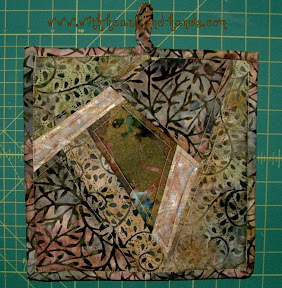 Scraps multiply like bunnies, you can always find more to create more fun things! No pattern is even needed, for any of these, but I do include photo tutes in my side bar at all times for these. 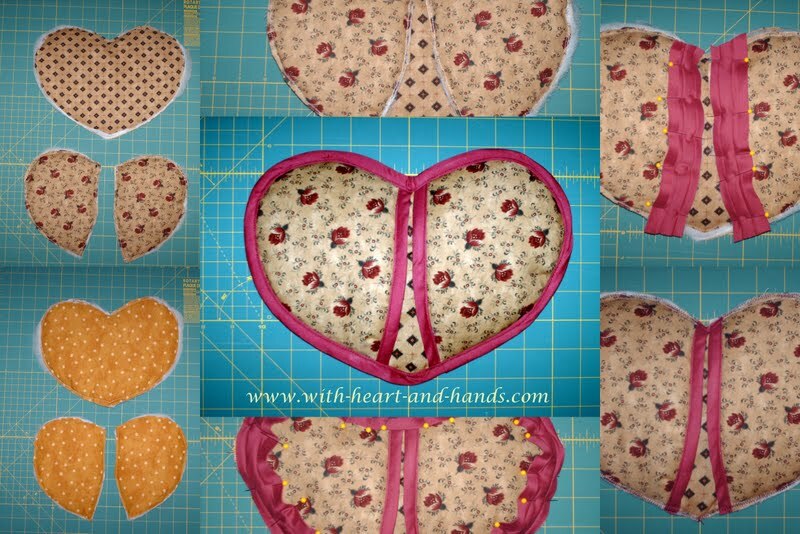 Without a tutorial, just cut your batting to size, and flip and stitch random pieces of fabric ..beginning in the center and moving out from each end. This is the same technique used in String Quilting quilts! Super easy, and so relaxing and fun to make! 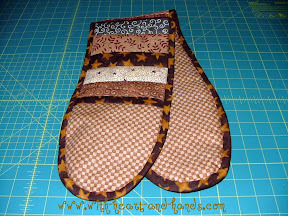 A double handed potholder hanging over the oven door really pushes them over the top as 'kitchen art' and gets them noticed, as most potholders are in drawers when not in use. So, a double handed potholder is not only functional, but door art, and is a greatly appreciated gift..especially if you make new ones every year..or even better, for every holiday! Imagine these in Christmas fabrics, or Valentine's, or even Easter..how cute would that be? And for Christmas, and birthdays, because my own three grown children are all exceptionally artistic, they pretty much have to be handmade and I try a bit harder to experiment with an artistic element or two...just for my fun, as well as to learn how to do new things. So, now if the fabric is right for being a bit more artsy...and batiks, or course, are perfect....I do something extra as I did here by rubbing on a bit of metallic shine with Shiva oil paint sticks. You simply let the stick paint dry for 24 hours after applying them, and then iron them...with a fabric sheet or a pressing cloth between it and the iron...for a few minutes to super set them. They are not only gorgeous pretty, but completely washable and no, they don't rub off after this process. 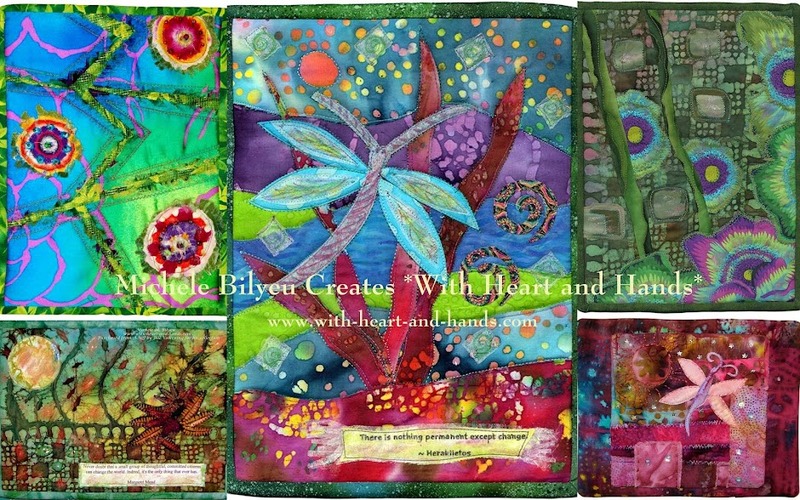 Now, my use of striking batiks and art crayons may be too over the top for you, but imagine them in folksy fabrics, country charmers, or vintage linens in a crazy quilt! Anything goes and any one of these can go from form and functional to a true art quilt for kitchen display, as well as use. Imagine a whole basket of your own little kitchen quilts on the counter for celebrations..easy to find, fun to use, and it shows off your own love of sewing and quilting to family and friends! Yep, everyday art is a lot of creative fun. And for me it takes a lot less time, than going shopping, parking, searching, buying, and bringing home store bought gifts. Gifts from my heart and hands to theirs...both figuratively, and literally! 1. Collect the orphan blocks, strips or strings, you wish to use. These are mine and no matter what, I knew I was going to make them...and only them...work. 2. Begin the process of laying down pieces and strips, beginning from the center (I used that one big chunk with the stripe in the middle) and adding strips...as if making a crazy quilt. 3. And because you want to be free and easy and not precise... only random...I just keep going around and around ...similar to adding logs to a log cabin block. 4. 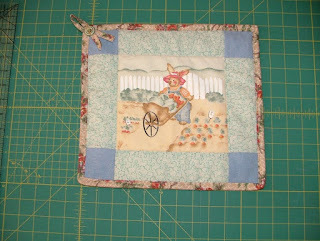 When you are happy with it, then you can add borders, if you choose, or a backing and just bind it...or not! I added in pieces of selvage to some of mine. 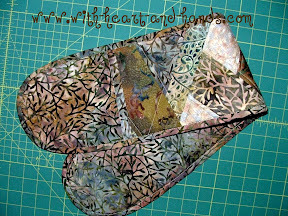 Add your backing (or you can do your piecing through a backing fabric just as if it were a string pieced foundation fabric! I do that a lot!! Quilt as you go, made easy! 5. Here the binding strips..I keep mine wide and double them up for durability with two rows of stitching..I use my pot holders a lot! 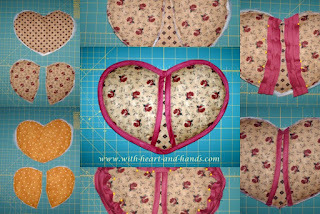 6.Stitch down the binding, thinking about a little back piece for fun and I did add in the little heart on the back by the end. 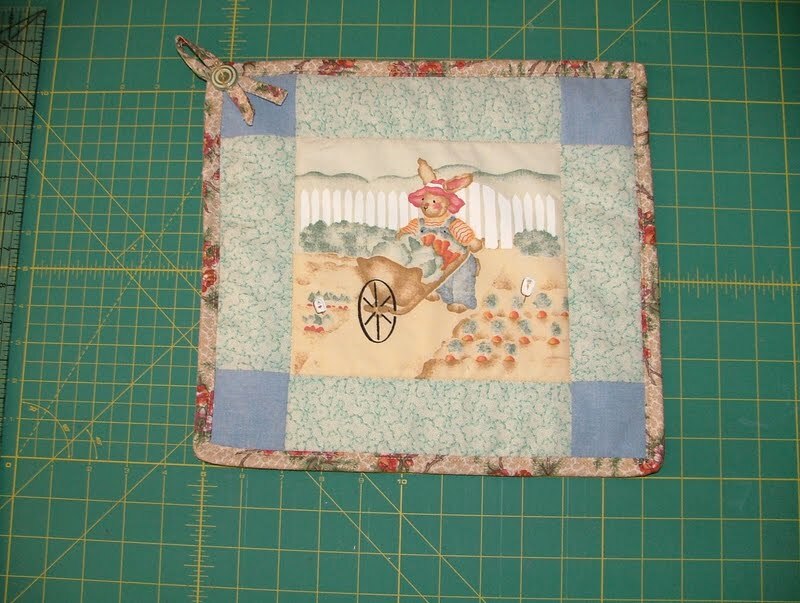 Need projects for older children who are learning to sew or need teacher gifts? 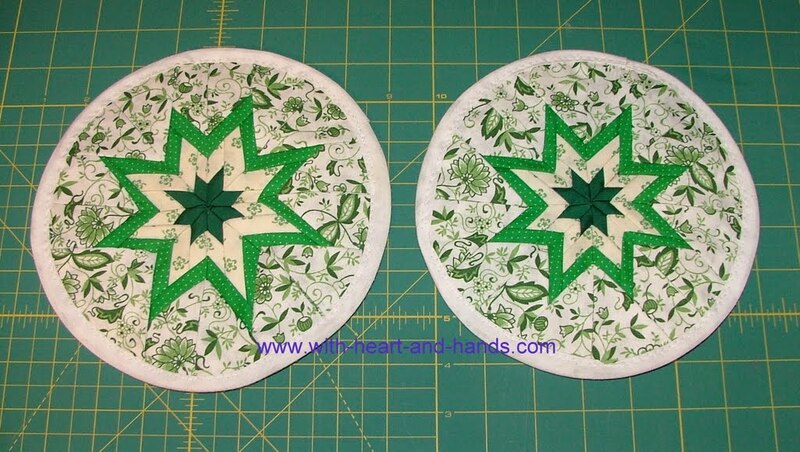 How about for sewists who can make simple things but are afraid of "quilting"? 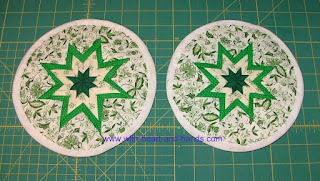 How about Somerset Star layered potholders for those who have talents and want to expand them? So many terrific things to make and do! 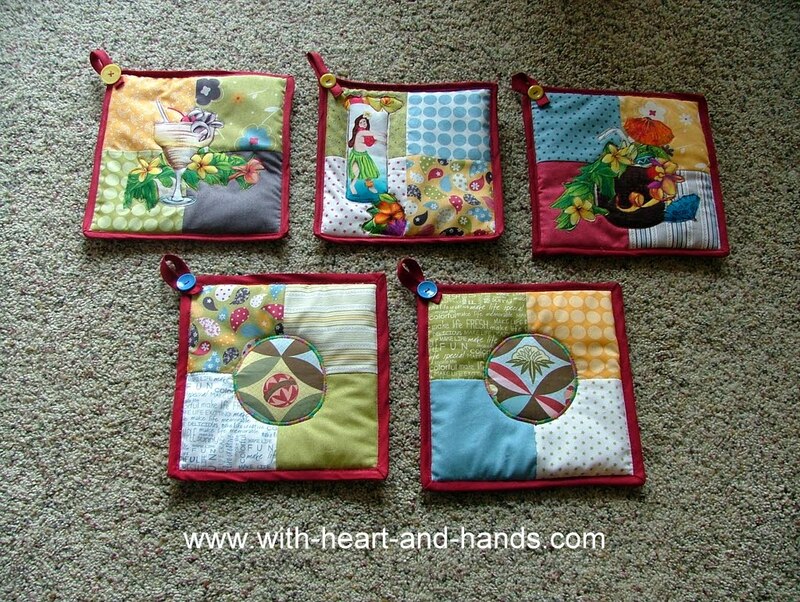 For other potholder tutorials...More Kitchen Quilt Magic!...check out"
I love to also make coffee press wraps to match, as well as double handed potholders that can easily lift hot casseroles out of the oven, but hang over the handle on your oven door when you're not using them. Check out my other links below! what a great idea about the paint sticks, I have those EXACT 3 that I bought at a show last summer and they are still in the pack, I'm afraid to open them.... imagine that... I am going to a craft show in a few weeks and I was planning on making pot holders- owl ones I made up, but some different ones would be cute too. Your kitchen has the best "kitchen art" I've seen. What a great idea. Thanks for sharing. Guess we are "potholder friends". U r right..they are the best gift. My kids used to draw pictures for their teachers and sit on my lap to help with the potholder gifts. Even though that was a long time ago, I bumped into a teacher recently who still had hers. LOVE your potholders, and the hint of using metallic Shivas on the fabric. I really MUST try your instructions . I wonder if I can bling and zing them? Loved this! But to be honest...I wrote to Bea and warned her about the downside to paint sticks. Incredibly messy, I had iridescent fingers for a whole week after one project, you loose a huge chunk of the stick each time you have to repeel all the using surfaces off each time you use them, and if you flake off pieces onto the carpet..you will never, ever, ever get them out no matter how hard you try once they've mashed in because you didn't know they had fallen on the floor! I love them, I love how they look, but the downside makes me wish I had a garage art studio with a floor that could take abuse like paint and such! Maritza is one of my favorite international bloggers. She leaves me the nicest comments and gives me practice in using Google translate so I can write her back each time. I always wonder what she ends up thinking I am saying, because you know how those translation things can do, sometimes! But she is a real sweetheart, check out her blog!!! Again, Betty Lou is one of those super nice commenters, I can't go wrong having blog readers like her. She's super! 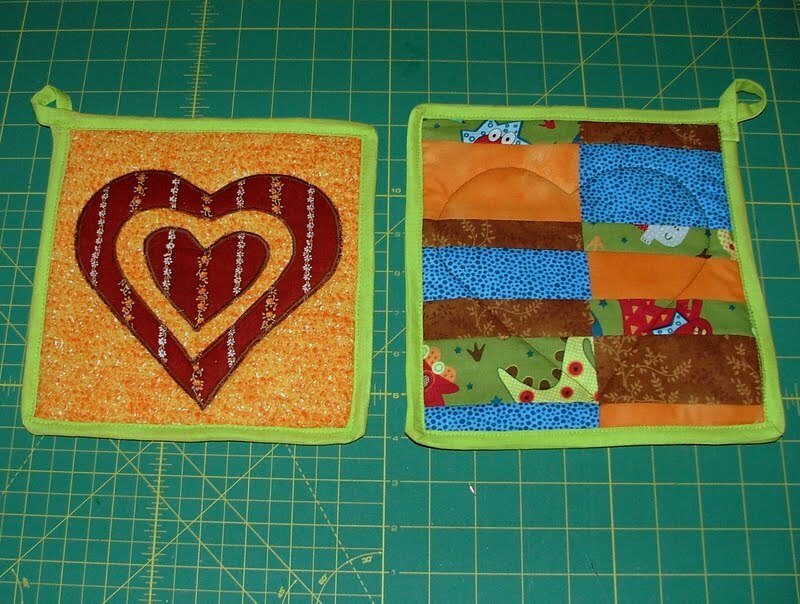 Another potholder maker and donator...love, love, love this. Check out her blog and see the ones she just made..such fun! Maureen, is such a lovely art quilter and a dear woman. 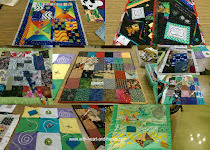 She is a member of postmark d'arte and made three postcard/quilts for my AAQI Liberated Challenge. 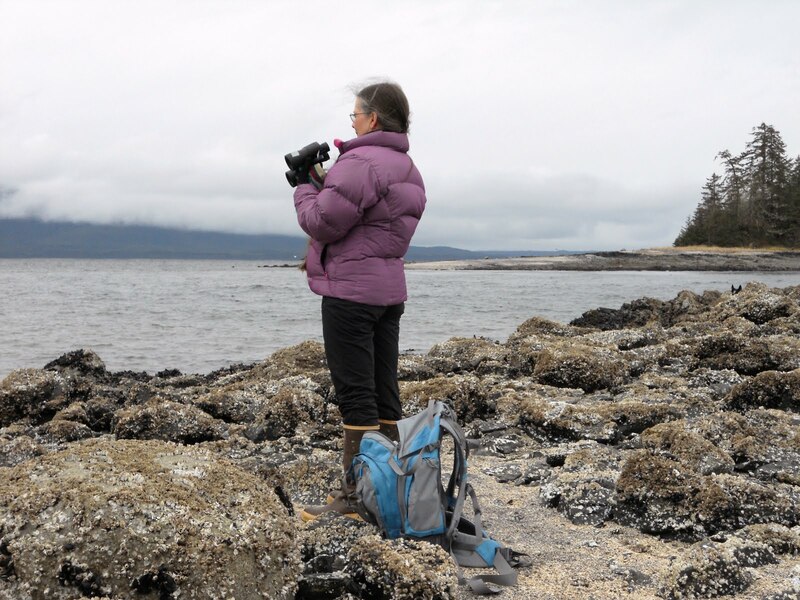 I always have fun seeing what she is up too down under and over at her own blog! I love what you are doing with these! It's such a different kind of pot holder than most of us are used to seeing but very rich and striking. It truly does look like art. Thank you so much, Cathy! That means a lot! These are great gift ideas, and beautiful too. You'll be please to know that I am thinking of making a table runner for Christmas! My first household item!